With the help of local credit unions and state leagues, the Credit Union National Association (CUNA) intends to raise $100 million over the next three years to fund and sustain a research-driven national credit union awareness program. “Open Your Eyes to a Credit Union” is an industry-wide initiative to educate a new generation of consumers. The announcement came during CUNA’s “America’s Credit Union Conference” in Boston last week. CUNA President and CEO Jim Nussle said the future of the credit union movement depends on more Americans than ever opening their eyes to everything a credit union offers them. The U.S. credit union market share has been 7 percent of total depository-based financial services for several years. Meanwhile, banks routinely outspend credit unions $43 to $1 on marketing efforts. Sustainable, with a digital-first, hyper-targeted approach to get maximum impact for its dollars. This program will allow credit unions to work together to tell a compelling story about the entire credit union movement. This will complement and amplify every credit union’s individual marketing spend—creating a rising tide that lifts all credit unions. Equitable. As part of this movement-wide initiative, every credit union will have the opportunity to contribute in a fair, appropriate manner. CUNA will be sending information packets to credit unions in the coming days and weeks with a personalized as specific to that credit union. Transparent. For every dollar contributed, 90 cents will go to a national media buy, and the remaining 10 cents will be used for future consumer research, creative content development and operations. CUNA invested more than $2 million to create an advisory group comprised of marketing experts who devised a data-driven campaign to combat two myths consumers believe: They can’t join a credit union, and they can’t access their money. Now credit unions across the country are joining together to tell a new, compelling story to disrupt the financial services industry and retain relevancy in the future. 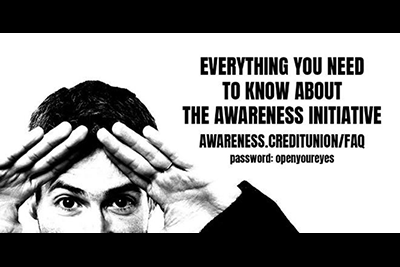 To learn more about the “Open Your Eyes” campaign, visit www.awareness.creditunion and type the password “openyoureyes” to access the messaging guide. Please read the disclosure. Also, additional materials will be added soon.